This Cajun chicken and pasta skillet dish is quick and easy to prepare. It's made with diced cooked chicken, spicy Cajun seasonings and cayenne pepper, tomatoes, Parmesan cheese, and a variety of vegetables. 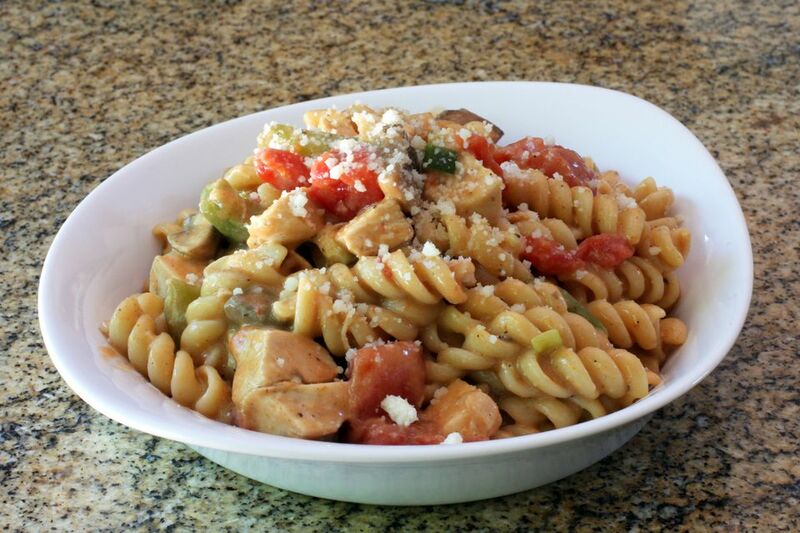 Enjoy this flavorful chicken pasta dish with a salad and cornbread or biscuits. Use fusilli, rotini, or similar pasta in this easy recipe. Cook the pasta in boiling salted water following package directions. Drain in a colander, and rinse well with hot water. In a large skillet over medium heat, saute the mushrooms and sliced red and green bell pepper until the vegetables are tender and mushrooms are lightly browned. To the mushroom mixture, add the sliced green onions, minced garlic, and chicken; cook, stirring constantly, for 1 minute. Stir in the Cajun seasoning, cayenne pepper, and black pepper; cook, stirring, for another minute. Add the soup, milk, and tomatoes. Bring to a simmer. Stir in the grated Parmesan cheese and the cooked pasta. Heat through.